A Great Deal for Job Posters! Submit your payment (only $50 for members or just $75 for not-yet-members) then post your job listing. All position announcements are posted on the AFP-GSFV Job Center for 90 days. 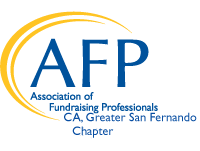 Position announcements are also distributed via email to current AFP-GSFV members and to community members who have opted to receive these notifications. Your job listing goes out to more than 500 fundraising and nonprofit-related professionals in the greater Los Angeles area. *Important* Your position announcement will not be posted or sent to the Membership via email until receipt of payment. Paid position will be posted within 2 business days. Pre-payment is required to process a position announcement with AFP-GSFV. Each posting is allowed one change at no cost. Any subsequent changes will incur an additional $25 fee per change. Membership is determined by the AFP-GSFV office. If an individual of your organization is a member, your organization -- for the position announcement service only -- is considered a member. For help, email our administrator.